Where is Floating Production Headed? 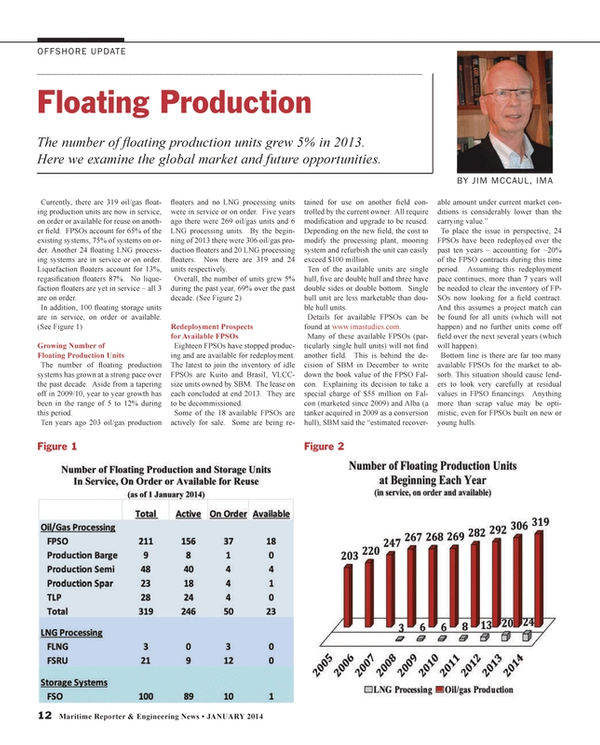 The number of floating production units grew 5% in 2013. Here we examine the global market and future opportunities. Currently, there are 319 oil/gas floating production units are now in service, on order or available for reuse on another field. FPSOs account for 65% of the existing systems, 75% of systems on order. Another 24 floating LNG processing systems are in service or on order. Liquefaction floaters account for 13%, regasification floaters 87%. No liquefaction floaters are yet in service – all three are on order. In addition, 100 floating storage units are in service, on order or available. The number of floating production systems has grown at a strong pace over the past decade. Aside from a tapering off in 2009/10, year to year growth has been in the range of 5-12% during this period. Ten years ago 203 oil/gas production floaters and no LNG processing units were in service or on order. Five years ago there were 269 oil/gas units and 6 LNG processing units. By the beginning of 2013 there were 306 oil/gas production floaters and 20 LNG processing floaters. Now there are 319 and 24 units respectively. Overall, the number of units grew 5% during the past year, 69% over the past decade. Eighteen FPSOs have stopped producing and are available for redeployment. The latest to join the inventory of idle FPSOs are Kuito and BrasiI, VLCC-size units owned by SBM. The lease on each concluded at end 2013. They are to be decommissioned. Some of the 18 available FPSOs are actively for sale. Some are being retained for use on another field controlled by the current owner. All require modification and upgrade to be reused. Depending on the new field, the cost to modify the processing plant, mooring system and refurbish the unit can easily exceed $100 million. Ten of the available units are single hull, five are double hull and three have double sides or double bottom. Single hull unit are less marketable than double hull units. Details for available FPSOs can be found at www.imastudies.com. To place the issue in perspective, 24 FPSOs have been redeployed over the past ten years – accounting for ~20% of the FPSO contracts during this time period. Assuming this redeployment pace continues, more than 7 years will be needed to clear the inventory of FPSOs now looking for a field contract. And this assumes a project match can be found for all units (which will not happen) and no further units come off field over the next several years (which will happen). Bottom line is there are far too many available FPSOs for the market to absorb. This situation should cause lenders to look very carefully at residual values in FPSO financings. Anything more than scrap value may be optimistic, even for FPSOs built on new or young hulls. Orders for 22 production floaters with a total contract value of ~$17 billion were placed in 2013. The orders include 11 FPSOs, two TLPs, one Spar, one Barge, six FSRUs and one MOPU. A 12th FPSO (Rosebank) was ordered but the contract was suspended pending review. Details for orders in 2013 are available at www.imastudies.com. The market seemed to hit resistance in 2013. FPSO orders in particular were relatively weak. Over the past ten years an average of 13.6 FPSOs have been ordered annually. Only 11 FPSO contracts were placed in 2013. Resistance seems to be in the supply chain. Construction costs have been increasing, local content targets have been creating bottlenecks and access to financing has been constrained. Oil company investment resources also have been shifting to shale oil and gas project development. We see supply chain resistance and competition for investment resources from shale oil/gas projects continuing over the near term. Our new five year forecast of production floater orders reflects this – and our forecast of orders between 2014 and 2018 is down significantly as a result. 234 floating production projects are in various stages of planning as of beginning January. Of these, around 55% involve an FPSO, 15% another type oil/gas production floater, 25% liquefaction or regasification floater and 5% storage/offloading floater. This large backlog of projects in the planning cycle is further indication that project investment opportunity is not the cause of the recent lethargic order pace. There are plenty of floater projects at or near the final investment decision stage. The decision to move to the contracting stage has been slowed by supply chain resistance and better uses of investment resources. Brazil and Africa are the major locations of floating production projects in the visible planning stage. We are tracking 50 projects in each region – 43% of the visible planned floating production projects worldwide. Brazil clearly leads in terms of production floater requirements – as several Brazilian projects will require multiple production units. Libra could require 12 production units, Jupiter six units, Lula two-plus units. When these large projects are taken into account, Brazil represents almost 30% of visible floating production system orders in the planning stage.